Extension and intension are two ways of indicating the fundamental meaning of a concept. The extent of a concept, C, is the set of objects which correspond to C whereas the intent of C is the collection of attributes that characterise it. Thus, intension defines the set of objects corresponding to C without naming them individually. Mathematicians switch comfortably between these perspectives but the majority of logical diagrams deal exclusively in extension. Euler diagrams indicate sets using curves to depict their extent in a way that intuitively matches the relations between the sets. 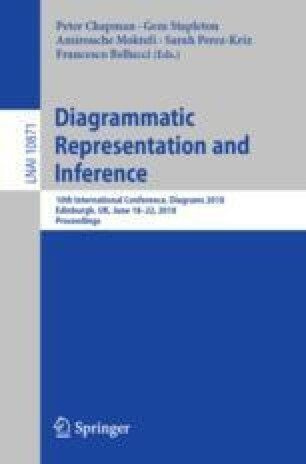 What happens when we use spatial diagrams to depict intension? What can we infer about the intension of a concept given its extension, and vice versa? We present the first steps towards addressing these questions by defining extensional and intensional Euler diagrams and translations between the two perspectives. We show that translation in either direction leads to a loss of information, yet preserves important semantic properties. To conclude, we explain how we expect further exploration of the relationship between the two perspectives could shed light on connections between diagrams, extension, intension, and well-matchedness.